One of the most popular events in the Texas Hill Country comes to Horseshoe Bay Resort each spring. 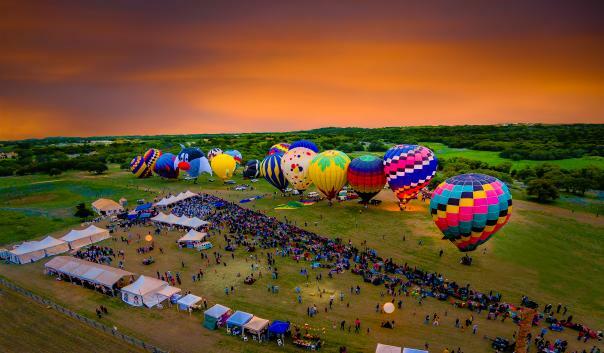 Twenty hot-air balloons from across America will converge at Balloons over Horseshoe Bay Resort on Easter weekend, March 25-27. This year’s festival features new activities including: hayrides, a kids rock-climbing wall, powered parachutes and more. Friday’s opening night festivities (open to resort overnight VIP package guests only) will include tethered hot-air balloon rides for all attendees, live music by the The Crush and a BBQ dinner buffet. Adults receive wine-tasting tickets to enjoy Hill Country wine tastings. Saturday’s festivities (open to the public) start with a balloon ascension beginning at 7 a.m. followed by a powered parachute demonstration and children&apos;s activities including rock climbing, bungee trampoline, safari animal show and more. Saturday evening will include skydivers, wine tastings, arts fair, the Balloon glow grand finale and live music from Milkdrive and Ed Kowalczyk. On Sunday, the festival will conclude with private balloon rides in the morning and a Grand Buffet Brunch featuring live music at the Palm D’ Or Pavilion at Horseshoe Bay Resort. Tickets for Saturdays festivities are $20 per adult. Children 12 and under are admitted free with parent (limit two free children per accompanying parent). Parking on site is available for $10 per car. Want to stay overnight? Festival VIP Packages start at $449 per room and include accommodations and access to all three days of the festival for two adults and two children, including Friday nights dinner and Easter Sunday’s gospel brunch. To inquire about weekend reservations, call 877-258-4512 or visit balloonsoverhsbresort.com.